Hello out there! Can you believe it's December?? Every day that passes I realize it's one more day I haven't created a new post. With that said, there are two reason I've been MIA. For the past week or so, my internet was a little touch and go, but I think it's fine now. And I've also been quite under the weather for the past week...enough that I went to Urgent Care in Yuma. As I'm writing this, I'm probably about 70%. But I'm going to take a stab at it anyway! The show must go on! 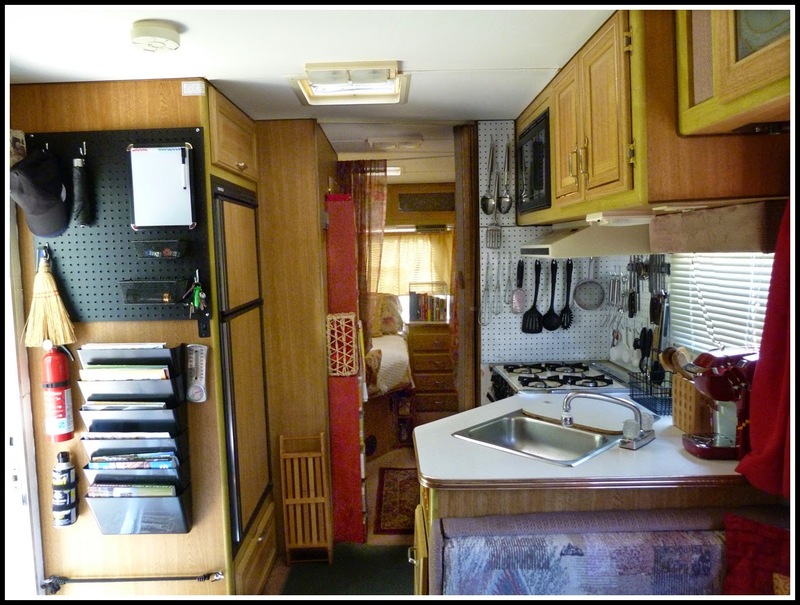 What a lot of people tend to not realize is the RV lifestyle is a LIFESTYLE...just like living in a big city, a small town, on a farm, in an apartment/condo, a subdivision, etc. It's really NOT an un-ending vacation or camping trip. Sure, for the first part of this adventure, it seemed as if it was because I was hopping across the country, relatively quickly, showing you (and myself) a lot of sights. However, when you settle down in one spot for any length of time, IT'S WHERE YOU LIVE....and stuff happens just like living anywhere. You make friends in your "neighborhood", people get sick, your neighbors help you out (and they really do here! ), people decorate their "yards", pets go over the Rainbow Bridge, you burn your hand on the stove. You cook, clean, do errands, take care of house maintenance items, rearrange closets and all that other good stuff. It's not all fun and games! Nothing tells you all this quicker than not feeling well. But, once you embrace it, which takes a little while if you're just starting out full time, it is a very unique, enjoyable lifestyle! You can live anywhere, anytime! I trust everyone had a wonderful Thanksgiving! 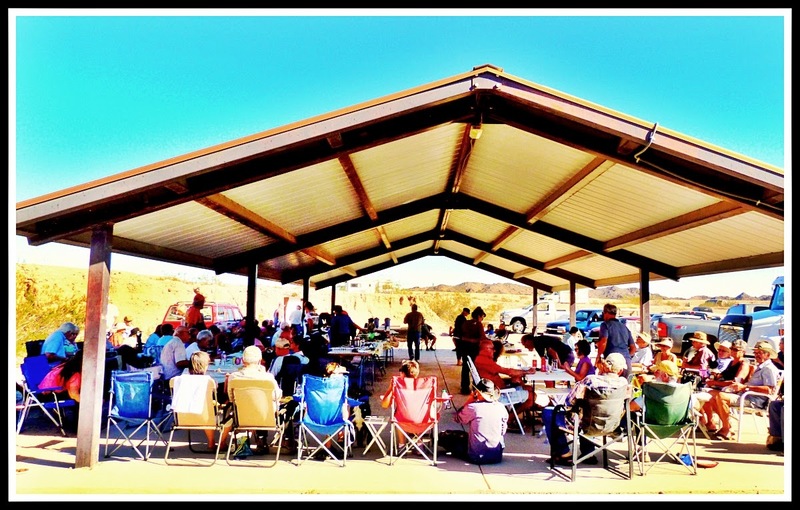 We had a pot luck here at the BLM. About 80 fellow RVers were in attendance. There was a lot of mighty good food! I made Orange Streusel Sweet Potatoes. I should have taken a photo, but I took them out of the oven at the very last second so they would stay hot. But, I did get a photo of the "after"! They were gone in a jiffy! I think the streusel topping was something different for everyone. (I had two helpings, myself! LOL!) I cooked my potatoes with a little orange juice in the pressure cooker, drained and added some brown sugar and a little cream cheese and a pinch of salt (a little bit of salt always enhances the flavors in something sweet like this.) Mashed them up by hand and added the streusel topping. Find any streusel topping recipe (I substituted the water with OJ and added a drop or two of orange extract) and cover the entire top of your sweet potatoes. Bake until the streusel gets slightly browned and crunchy. Try them for Christmas -- or anytime! Really yummy! The gathering was at the "Gravel Pit Ramada". It is huge and below grade. I could have walked over there if I hadn't been carrying a piping hot casserole, a chair, and my camera. My friends, Karen and Brad, were kind enough to pick me up. The ramada is also host to aerobics and yoga classes during the week and a music jam on Sunday afternoons. Must get to that! It was on the "something fun list" for today, but I don't think I'm feeling well enough. Hopefully, next Sunday! 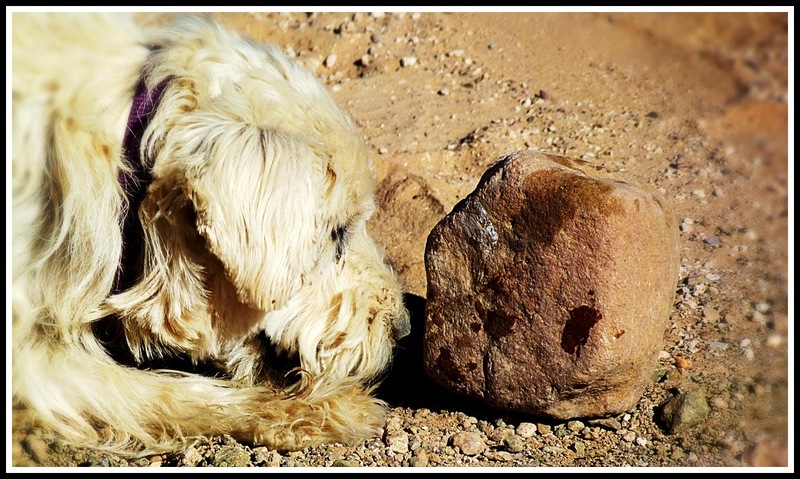 The "Rock Star" of the holiday was Mena... Karen and Brad's sweet little pooch.... she LOVES rocks! 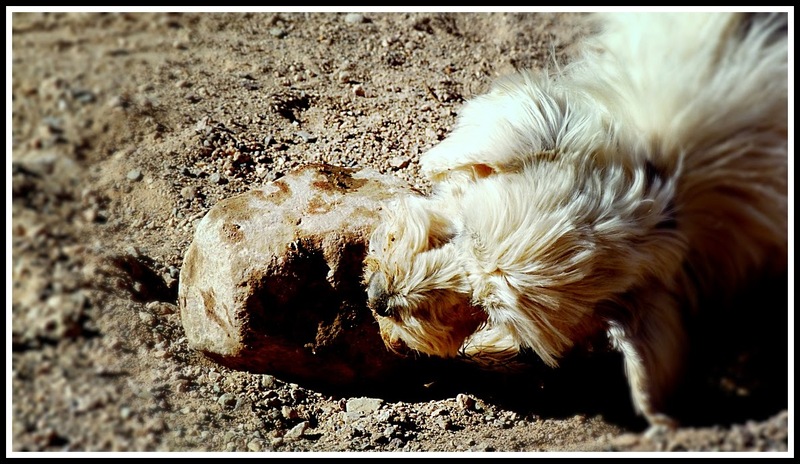 She totes pretty good size rocks around like stuffed animals. So funny! She had quite an audience. She stares them down.......then.......moves in for the capture! She rarely kills one, tho'! LOL! Okay....so what else has been happening out here at this great BLM site??? Every single day isn't "perfect" here as far as the weather. We've had a couple of very high wind days with blowing sand and dust. Nothing to do but stay indoors. Although, one morning it didn't start out windy but by the time my golfing buddies and I were about half way through the course.....WOW! It was hard to stand up. Had dust grit in our mouths and eyes and our golf balls were carried every which way. But, do you think that stopped us?? NO! LOL! But we all commented the next day on how exhausted we were from fighting the wind when we finished up that round! Here are a few shots of the worst day....starting first with a "normal" day overlooking the reservoir....yes, it really looks like this! 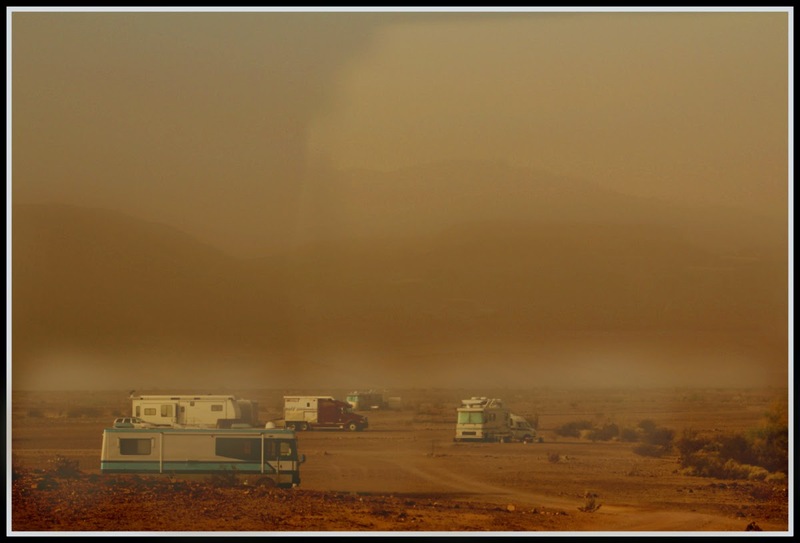 Really glad those days don't pop up often..... plus, anything you have stored outside your RV is, as you can well imagine, covered in dirt and sand. UGH! That was outside. Let's move indoors! I don't think I've ever gotten around to posting photos of the INSIDE of my house. What better time than now? It's fairly self-explanatory! C'mon in! 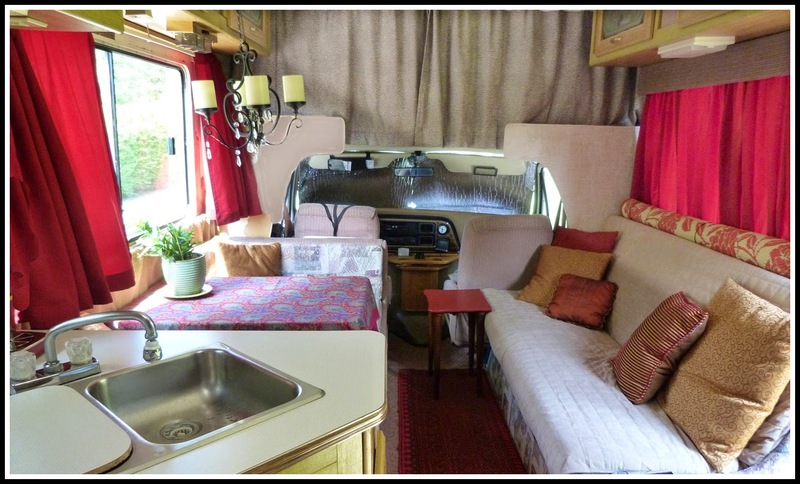 I feel like I took this from a relatively no-character "camper" to a home by adding drapes (I, personally, much prefer them over shades or blinds), decorator pillows, oriental rugs, "chandelier", the convenient peg boards, etc. Being almost 25 years old, nothing at all fancy here, but it is quite efficient. Once you pare down to the essentials (which are WAY less than you would first think! ), there's really plenty of space for just about everything. I have extras that a lot of people may not have -- painting canvases, art supplies/paints, a boxes of some of my framed photos and the ceramic Aura Tiles I make,..stuff like that and still enough space. There are three things I would change if I could. 1) the bed in the corner - IMPOSSIBLE to make up! Looks ok here, but it took over 30 minutes to get it that way! 2) a little more kitchen counter space somehow; and 3) get rid of all the carpeting and replace with Allure wood plank flooring. Lots of RVers have done this. It's relatively easy and inexpensive to install yourself. It's on my bucket list! But, overall, this house is very workable. Even with no slides (which I think are just another thing that can have problems..... but if I won the lottery, I'd probably upgrade with them! LOL! but you don't miss what you have never experienced! ), I never feel claustrophobic with so many large windows. Ultimately, it sleeps six, but I can't imagine I will never have five people staying with me! A BIG THANK YOU to everyone who has been ordering through my Amazon link! Lots of holiday shopping going on! Still plenty of time if you have Amazon Prime... or subscribe now to start this great shipping benefit. It's well worth it if you order fairly regularly from Amazon. Free AND very fast shipping! Oh....and don't forget about gift cards. No worries about what anyone needs or wants....they can choose for themselves from millions of products. What better gift?? I will leave you with some early morning light shows.....no better way to wake up than seeing nature's effortless artwork! Love these striated, sunrise clouds! I will check in before the holidays....it's beginning to look a lot like Christmas around here! Great post! Sorry you've been ill, hoping that soon leaves! Liked seeing inside, even though I did see it early on, before you left. I'm so glad there are good neighbors! Can't imagine spending the entire winter with no one around at all! Like the sunrise photos....I'm seldom up at that hour! Sorry you've been sick, but it happens to us all, sooner or later. We were down in Harlingen in '94, and I got the flu so bad on New Year's Day that I could have died and felt better! Sharon had to drive most of the way back to Arkansas that week! Thanks for the idea of using orange juice with sweet potatoes! That sounds really good! We'll try that for Christmas! Love what you've done with the place!! It really does look great. Sounds like you had a nice Thanksgiving with your very nice sounding neighbors. Glad they helped you out when you were feeling bad, too! The sand storm looks awful! We got pelted on the beach in GA once with hail that literally came out of nowhere! Boy, it hurt! Love all the pictures as usual and am glad you are feeling better! Sorry to hear you've had the gripa never a quick recovery. I have found after living in a dusty environment (South central NM) for years that a humidifier helps with the dry air and filters the casa's air a bit. Enjoy your photography - be safe and healthy. Thanks, everyone! I'm finallly feeling "normal" again! 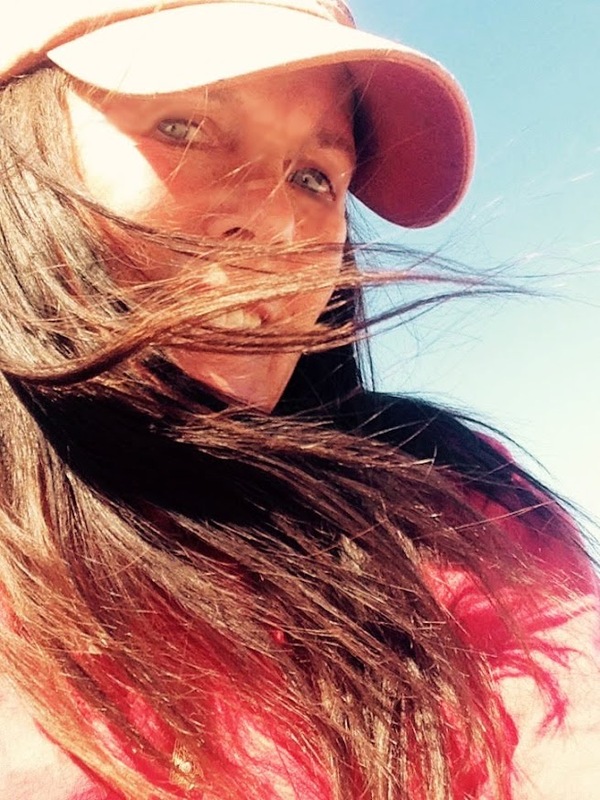 And thank you, JoAnn, for the heads up on the Escapees photo contest. I will definitely be checking that out! Thanks for thinking of me! Good job on the blog. Looks like you have adapted well. I like the story of your dog adoption, too.